Leaders from the Group of Eight (G8) industrialized countries began their summit Wednesday, with the economic crisis and climate change at the top of their three-day agenda. The summit started with a working luncheon, with the bulk of the first-day discussion generally focusing on the troubled global economy. The G8 leaders, from the United States, Britain, France, Germany, Italy, Japan, Russia and Canada, were expected to issue a statement on the situation of the world economy. Nearly one year after the financial crisis developed, the world economy remains in a deep recession that has not been seen since World War II. Thanks to massive stimulus packages put into motion by national governments, however, the G8 finance ministers agreed in June that there are signs of stabilization of their economies, which account for two thirds of the world’s total output. The ministers called for appropriate exit strategies to loosen the extraordinary policy measures. Michael Froman, President Barack Obama’s economic adviser, said the summit would be a time for the leaders to get together to assess the effects of the economic recovery effort and decide on additional steps. The World Bank warned on the eve of the summit that the G8 leaders should not be overly optimistic about a global recovery. “Yet 2009 remains a dangerous year. Recent gains could be reversed easily, and the pace of recovery in 2010 is far from certain,” World Bank President Robert Zoellick said in a letter to the G8 leaders. The G8 leaders were expected to make a new push for global financial reforms in order to prevent another crisis, but Italian Prime Minister Silvio Berlusconi, the host of the summit, on Friday downplayed any prospect of new rules. The summit, he said, will be just “one step” in a long process. That confirms expectations that key decisions on global financial reform are likely to be postponed until the next meeting of the G20 in the U.S. city of Pittsburgh in September. 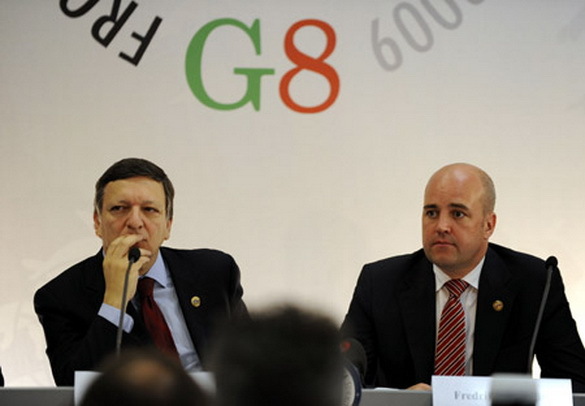 On Thursday, the G8 leaders will be joined by their counterparts from the five emerging economies — Brazil, China, India, Mexico and South Africa — under the expanded session of “8+5”. Egypt was invited to this week’s meetings by the Italian presidency to represent Middle East and African countries. The G8 leaders will try to forge a deal on additional cuts in greenhouse gas emissions in the global fight against climate change. The summit is considered crucial for a new global pact on climate change to replace the current Kyoto Protocol that expires in 2012. The world’s governments meet in Copenhagen at the end of this year to wrap up the negotiations. It had been expected that leaders from the major countries could agree to an overall target of cutting greenhouse gas emissions by 50 percent by 2050, with the rich nations reducing theirs by 80 percent. Differences on burden sharing, however, remain unresolved. Last-minute negotiations appear to be retreating from expectations. Indian Prime Minister Manmohan Singh urged the industrialized countries to bear up to their “historical responsibility” on climate change before he left Tuesday for the summit. “What we are witnessing today is the consequence of over two centuries of industrial activity and high consumption lifestyles in the developed world. They have to bear this historical responsibility,” Singh said. On the final day of the summit, leaders and representatives from 40 countries were to consider food security in Africa, another issue high on the agenda. They are expected to pledge 10 to 15 billion U.S. dollars to help feed the poorest people in the developing countries, Berlusconi said Tuesday. “We hope to approve an initiative for food security in the world. We will approve about 10 to 15 billion U.S. dollars for all the people in the world who are suffering from hunger,” the Italian premier said at a news conference. Previous Previous post: The document to be signeds. Next Next post: Google for personal computer operating system.